Keep your camera ready for shooting at a moment's notice with the beautiful, handcrafted, brown/black, leather Wrist Camera Strap from Heavy Leather NYC. For comfort the strap is 2" wide and features side binding. This lightweight wrist strap is only 2.0 oz and the length is 10.5". Use the tripod mounting screw and washer to attach the wrist strap to the bottom of your camera. There's a hook that connects to a camera strap lug as well. This wrist strap is made in the USA. Box Dimensions (LxWxH) 4.3 x 1.8 x 1.0"
Wrist Camera Strap (Brown/Black, Leather) is rated 4.5 out of 5 by 2. Rated 4 out of 5 by Walter M. from Heavy Leather Wrist Strap I have 2 of these, the leather is strong, more than adequate to hold a dslr. It will fit well on a body with no battery grip attached. It will be too short for a body with battery grip or a large camera body such as a D5. I use these on 2 D810 with battery grip, so I had to add to the length 2 to be able to comfortably access the controls, and especially the toggle, when shooting portrait position. Rated 5 out of 5 by Denis from Probably the best one I found. I was looking for a strong leather camera wrist strap in brown. That one is very nice, solid and heavy duty. 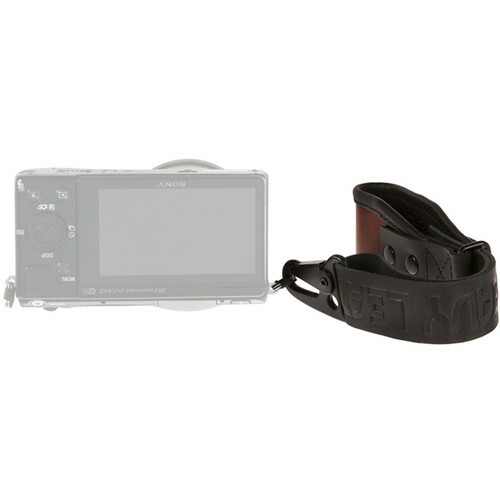 It’s simply hold your camera on the wrist in the most comfortable and secure way. And it has a simple classic look that fits to my Fujifilm X-T1 graphite edition.